A trail-tested list of the best budget backpacking tents for wilderness adventures. A backpacking tent is not a good place to cut corners when it comes to quality. On trips into remote wilderness, a shelter will be one of your most important gear choices for safety and comfort. When the weather turns nasty, you’ll want to have confidence that your tent will stand up to the elements. But a quality backpacking tent shouldn’t cost an arm and a leg either. If you’re on a tight budget, you may not be able to afford one of the best lightweight backpacking tents on the market, but that doesn’t mean you should sacrifice on safety. We put together this list to showcase some solid budget tents that strike a good balance between cost, weight, weather protection, and durability. These tents aren’t leaders in quality, but beginners and budget buyers will greatly appreciate their cost effectiveness and performance. The REI Co-op Passage 2 has a classic rectangular tent design with dual crossing poles, double doors, and large vestibules. This tent doesn’t have a top crossbar to make the walls more vertical, which slightly reduces livability, but the Passage still functions quite well. The Passage 2 also has a fully-rectangular floor, two condensation-reducing top vents, and lots of interior mesh pockets. If you're willing to pay a bit more for an increase in size and livability, we recommend checking out the REI Half Dome 2 Plus, which is also a solid budget buy. Pick up the Passage 2 footprint if you want to increase tent floor durability. The Passage is also available in a 1-person model, and the Half Dome also comes in 1 Plus, 3 Plus, and 4 Plus models. Top Pick: The Passage 2 and Half Dome 2 Plus are our top picks for budget backpacking tents. For more of our top picks, check out the CleverHiker Top Picks page. The Mountainsmith Morrison 2 has a similar design to the REI Passage 2 (classic 2-door, rectangular tent with crossing poles), but it can often be found at a lower price. Like the Passage, this tent doesn't have a top bar to make the walls vertical, which slightly reduces interior livability. That said, the Morrison does have roomy dimensions, which helps it deliver more interior space. We prefer the nylon tent body of the Passage 2 over the polyester of the Morrison, and the Passage also has larger vestibules, but both tents are solid budget buys. Mountainsmith's Bear Creek tents are lighter and even more affordable, so they may be a good fit, but their single-door, small-vestibule designs cut down on livability. Pick up the Morrison 2 footprint if you want to increase tent floor durability. This tent is also available in a 3-person model. The Alps Mountaineering Lynx 2 is another budget tent with a simple, classic design. The Lynx can often be found at even lower prices than the Passage 2 and Morrison 2, but it's also on the heavy and bulky side for backpacking. That extra weight and bulk does come with the benefit of increased interior space, but again there's no top crossbar in this tent for vertical sidewalls. Alps also makes the Chaos 2, which does have a top crossbar for more headroom, but the Chaos is more expensive, heavier, and has a shorter length, height, and width than the Lynx. Pick up the Lynx 2 footprint if you want to increase tent floor durability. This tent is also available in 1-person and 4-person models. The Kelty TN2 is a budget tent with good headroom and a cool stargazing rainfly feature. The TN2 is also much lower in weight than many budget backpacking tents, though it’s still not as light as our favorite lightweight tents. We like how the rainfly on the TN2 can be rolled up in clear skies and quickly lowered if the weather changes. The main downside with TN2 is that it’s shorter than most tents, so it’s not a good fit for tall hikers. It also doesn’t have any interior pockets, and one of it’s doors is smaller than the other for some reason. Kelty also makes the popular Salida and Grand Mesa series, both of which are lighter, longer, and more affordable than the TN2, but their single-door, small-vestibule designs cut down on livability. Pick up the TN2 footprint if you want to increase tent floor durability. This tent is also available in 3-person and 4-person models. The Marmot Catalyst 2p has a good blend between weight and interior space among budget tents, due to its arching crossbar design. The Catalyst has a unique asymmetrical shape, but the end result is still effective. One nice feature with this tent is that it comes with a footprint included, which will save you some money if you’re looking for extra tent floor protection. This tent does have it’s quirks though, like its half see-through mesh, half polyester taffeta tent body, and the fact that it only comes with six tent stakes for it’s eight primary stake points. The main downside with this tent is that it could use more ventilation to keep interior condensation down, which is a common downside among budget tents. All quirks aside, the Catalyst is still a quality budget option. This tent is also available in a 3-person model. The North Face Stormbreak 2 is a durable budget option with two top crossbars that help increase headroom and livability. The Stormbreak also has two large vestibules that come in handy for external gear storage. The main downside with the Stormbreak is its weight and bulk, which limit its functionality as a backpacking tent. It also doesn’t have many added comforts, like interior pockets. Still, as a sturdy and durable budget option with plenty of interior space, the stormbreak is a solid buy. Pick up the Stormbreak 2 footprint if you want to increase tent floor durability. This tent also comes in 1-person and 3-person models. If you love backpacking and plan to hike a lot over many years, it probably makes sense to pay more for a high quality, lightweight backpacking tent. We think our best lightweight backpacking tents list provides the best combination of weight, cost, weather protection, durability, and ease of use for most backpackers. The best lightweight budget options on that list are the REI Quarter Dome and Marmot Tungsten UL tents. There are also some good budget options on our ultralight tarps and tents page, but those choices tend to be a bit more specialized, so we usually don't recommend them to casual backpackers. Make sure you read the “critical tent considerations” section (specifically the “setup” and “wall construction” sections) if you’re considering one of these tents. On our ultralight tents page, Tarptent's Notch, Saddle 2, ProTrail, and MoTrail are good budget choices. As is the Sierra Designs High Route 1FL and SMD's Skyscape Scout and Lunar Duo Explorer. Just remember, trekking poles are required for these tents and their weight/cost is not calculated in. In addition, Tarptent and SMD tents require seam sealing, which will add $30-35. PRICE - You shouldn’t have to spend a fortune to get a quality backpacking tent. If you backpack a lot, it may makes sense to spend more for a quality lightweight tent that will get many years of use. If you're looking for a step up in quality from the budget recommendations below, check out our top lightweight tents and ultralight tents pages. WEIGHT - A few ounces here and there might not seem like a big deal, but keeping pack weight down is critical for enjoying backpacking trips. Lightweight tents make hiking more fun, and that’s what it’s all about. Your tent will be one of the four heaviest items on your back (shelter, backpack, sleeping bag, and sleeping pad), so it’s a great place to keep weight to a minimum. 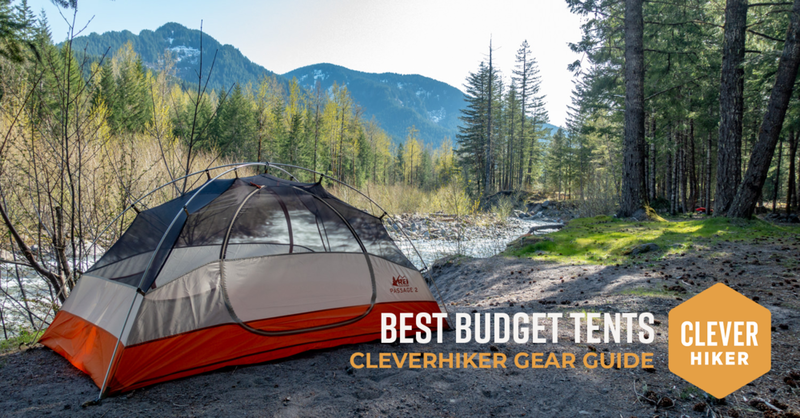 The tents we recommend on this list are lightweight by budget standards, but increased weight is one of the biggest tradeoffs with budget tent options. If you’re looking for a lightweight tent, we recommend checking out our top lightweight and ultralight tents pages. PROTECTION - A backpacking tent that doesn’t protect against the elements is worse than worthless, it’s dangerous. So be careful about extreme budget tents you'll find elsewhere. Every tent on this list will provide solid storm protection to keep you safe, dry, and warm. INTERIOR SPACE - Backpacking tents keep weight to a minimum by limiting interior space (and thus, use less material). Most two-person tents have room for two sleepers and a few stuff sacks, with backpacks and extra gear stored in the vestibules. If you want more interior space for camping comfort, you may want to bump up one size in tents (for example, buy a 3-person tent to fit 2 hikers). Just remember, interior tent space is a tradeoff between comfort and weight. 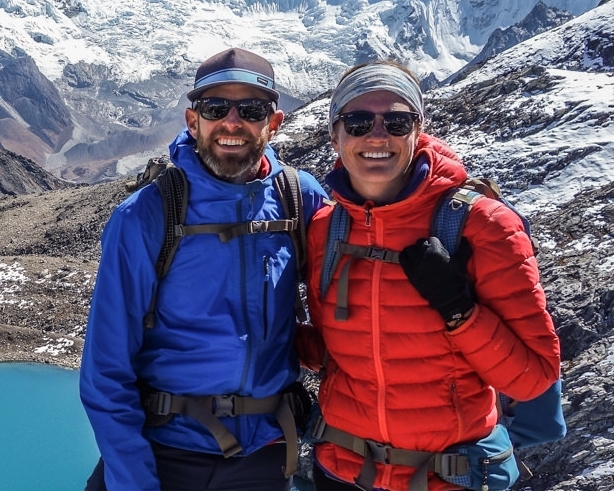 If you prefer hiking light and crushing miles, stick with a 2-person model for two hikers. If you’re willing to carry more weight for camping comfort, you may want to bump up one tent size. CAPACITY - 1-Person tents are great for dedicated solo adventurers looking to hike fast and light. 2-Person tents tend to be the most popular, because they strike a good balance between weight and interior space, just don't expect the interior to be palatial. 3 & 4-Person tents tend to get crowded and impractical, though they can be a good fit for 2 or 3 hikers wanting more interior space for gear storage and extended hangouts. SEASON RATING - 3-season shelters are the most popular backpacking tents and the style we focus on in this guide. They're built for spring, summer, and fall trips where you’ll need to keep bad weather out while promoting air circulation. 3-Season tents can usually handle a little snow, but they’re not made for heavy snow and winter conditions. DESIGN - A single design flaw can easily ruin an otherwise solid backpacking tent. Great tents keep design elements simple and include multiple doors, adequate vestibule space, lots of headroom, air vents to reduce condensation, and interior pockets for gear storage. SETUP - Freestanding tents are generally prefered because they’re easier to use and quicker to pitch. They come with a fixed pole system that can be set up almost anywhere, even on solid rock. Non-freestanding tents use stakes, guylines, and trekking poles for pitching. They save weight by cutting out tent poles, but require more time and space to pitch, and will take practice to master. WALL CONSTRUCTION - Double-wall tents come with two separate parts - a mesh tent body and a rainfly. The mesh inner-tent acts as a barrier from any condensation that forms on the inside of the rainfly. Single-wall tents reduce weight by ditching the mesh inner-tent, but that leaves hikers vulnerable to interior condensation in wet and cold conditions. Rubbing up against a wet tent interior is the pits, so that's why we mostly recommend double wall tents, unless you generally backpack in dry climates. For ultralight hikers open to the idea of single-wall shelters, have a look at our ultralight tarp and tent recommendations. DOORS & VESTIBULES - If you plan on sleeping two people in your tent, it's more comfortable to have two doors and vestibules. Having separate entrances will ensure that you’re not climbing over your tentmate and two sets of gear every time you want to get in or out of your tent. That’s a huge benefit, and it's why almost every tent on this list has two doors and vestibules. DURABILITY - The main tradeoff with ultralight tents is that they're built using thinner materials that tend to be less durable than heavy-duty shelters. That said, ultralight tents will last for thousands of miles if treated with a little care. It's also important to remember that a sharp stick will go through just about any kind of tent fabric. So if you're tough on gear and don't want to deal with lightweight materials, choose one of our heavier recommendations built for durability. Personally, we think ultralight tents are well worth the tradeoff. FOOTPRINT - Most tents don’t come with a footprint these days and many lightweight backpackers view them as unnecessary. The main benefit of a footprint is adding durability to the floor of your tent. A footprint will protect your tent floor from abrasion, so it will last longer and need fewer repairs. If you’re willing to carry some extra weight to extend the life of your tent, consider picking up a footprint made specifically for your tent. BUYING ONLINE - Check the seller's return policy before you buy, but you can almost always return an unused tent within a certain time frame after purchasing. We recommend buying your top choice, testing it at home, and returning or exchanging if it doesn’t feel quite right. We’ve been buying lightweight tents online for years and we’ve yet to have a single problem. If you enjoyed this review you'll probably like our other gear lists as well. Here are some popular resources from the CleverHiker Gear Guide.